From Tuesday, 1 May to Monday, 1 October, 2018. 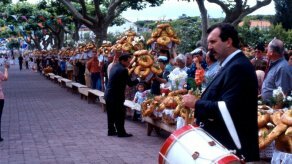 Secular worship enhances the experience of truly humanistic and solidary attitudes and values, such as the distribution of food for the poorest, meals offered to all people and the friendship between neighbors and friends, always accompanied by the music of revelers and the traditional dishes of the Festivals of the Holy Spirit. You can begin the experience of this cult, in all the islands.